Midway through the film, there’s a pivotal exchange between 007 (Daniel Craig) and effete psychopath Raoul Silva (Javier Bardem). ‘Everyone needs a hobby’, Bond ventures. Silva considers this and asks, ‘So what’s yours?’ Bond replies: ‘Resurrection’. As a piece of dialogue that hits the mark with the accuracy of a Walther PPK, it’s terrific. Yet it’s loaded and coded with a deeper meaning: after all, Bond is a franchise that has been resurrected more than most over its 50 year tenure, surviving innumerable actor changes, stylistic shifts and background political upheavals. Bond has survived contextual changes (the move from the Cold-War inflected Sean Connery era to the present day) and myriad financial wrangles (MGM’s torturous problems effectively ended Timothy Dalton’s era just when it was getting off the ground) to emerge, triumphant, from the ashes on more than one occasion. The wonderful thing about Skyfall, directed with a tremendous amount of brio by American Beauty’s Sam Mendes, is how it functions both as a commentary on this enduring British institution, and as a dazzling piece of escapism that continues the longstanding appeal of said institution. It is, in short, both enormous fun and surprisingly thoughtful, and such a massive cut above the incoherent Quantum of Solace that one wonders how the previous film could have gone so terribly wrong (admittedly it was hampered by the 2008 Writer’s Strike). Regardless, Mendes, not an obvious choice for such popcorn material, wastes no time in demonstrating his coherent, exciting and crisply edited action chops, kicking off with a thrilling Istanbul chase that moves from car to bike to train to digger as Bond pursues a villain who has in his possession a hard drive containing the identities of secret agents located worldwide. When fellow agent Eve (Naomi Harris) is ordered by Judi Dench’s redoubtable M to take an impossible shot, Bond is hit, plunging hundreds of feet into the river below. It’s the first sign that Mendes, along with writers John Logan, Robert Wade and Neal Purvis, has dared to put a bolder slant on a franchise that has been so often defined by predictable formula. As Bond’s body sinks into Danny Kleinman’s funereal credits sequence, set to Adele’s resonant and powerful title song (both of which are rife with foreboding), we understand immediately that Mendes is a filmmaker set on delving beneath the flippant exterior of the world’s most famous secret agent and exposing the emotions beneath. It turns out of course that Bond isn’t dead; instead, he’s been ‘enjoying death’ in a far-off locale. However he’s drawn back to London following a bombing at MI6, an event which appears to have chilling, personal ramifications for M. A drained and possibly broken Bond is dispatched to find the culprit, eventually revealed to be Bardem’s preening, scary, cyber-terrorist, whose blonde mop-top calls to mind classic Bond villain Max Zorin as much as it does Julian Assange. Silva’s targeting of M is indeed very personal, another fresh story device that hits the target with laser-guided precision, creating a palpably tense and rich emotional context in which the explosions and stunts play out. Skyfall isn’t the first Bond film to have attempted such a move. Some of the bravest entries in the franchise (On Her Majesty’s Secret Service; Licence to Kill) have dabbled in this area by delving into Bond’s marriage and friendships respectively, but rarely has it been this nakedly emotional. It also repeats the nifty trick of Craig’s Casino Royale by respecting the inherent ingredients of the series (glamorous locations; exotic women; evil villains; outrageous stunts) whilst ensuring it has relevance in the post-Bourne era through grittier violence and more of an emphasis on human emotion. 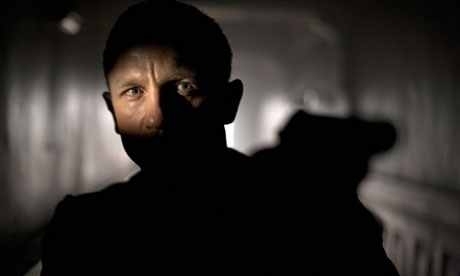 However, Skyfall manages to soar past Royale by virtue of how deeply it gets beneath Bond’s skin. Craig is terrific at exposing 007’s physical and emotional vulnerability. On-site at the new MI6 HQ, tucked away in a secret corner of London, he can barely sustain a series of pull-ups and collapses to the floor. Moments later, he finds he’s no longer able to shoot straight and the anguish in Craig’s face is palpable. It’s surprisingly poignant to see Bond in such a position but what really deepens the drama are the emotional avenues it takes with regard to his relationship with M (as ever, beautifully played with steely resolve by Dench). Ambivalent policy wonk Gareth Mallory (Ralph Fiennes) asks: ‘Why not stay dead?’ The answer is M herself. It would appear that, in Bond’s violent world, the only thing worth believing in is Dench’s surrogate mother figure, but rippling undercurrents of anxiety come into play when Silva starts messing with our hero’s head. Still harbouring rage over a perceived betrayal by M, Silva is a twisted flipside to Bond himself, a living embodiment of what betrayal can do to a man. It’s also implied that Bond, hurting over the film’s opening scenes, could go the same way. That a Bond movie can resonate with such dramatic Oedipal undercurrents speaks volumes about the intelligence that Mendes brings to the project. The influence of Christopher Nolan’s Batman trilogy becomes apparent here, perhaps overly so in Skyfall’s Joker-esque depiction of a diabolical villain who appears 10 steps ahead at all times. Yet whilst the story is meaty in many regards, other areas feel underdeveloped: the brief fling Bond enjoys with Severine (Berenice Marlohe) promises a redemptive sub-plot that ultimately comes to nothing and is discarded in the off-hand manner of the series’ worst films. But this is a relatively minor fault. And although Skyfall is willing to deconstruct and play with the mythology, rest assured it knows how to deliver the expected ingredients. Bardem is superb as the lip-smacking villain, making a grand, speechifying entrance in his first scene that secures him as a proper antagonist: camp, eccentric but very dangerous, and who also recognises the sporting qualities of the struggle with 007. The stunts meanwhile are as jaw-droppingly ridiculous as ever (a bike leaping onto a train) and the far-off locations (Shanghai; Macau) are lensed magnificently by DP Roger Deakins, who adds such a luscious sense of beauty to even the most routine moments (a stealthy pursuit inside a skyscraper) that it would be a travesty were he not nominated at the Oscars. Yes, it’s that good-looking. In fact, it’s certainly the most attractive film in the series to date. Mendes also recognises the importance of humour, especially in the new, eager-to-please incarnation of Q, played by Ben Whishaw (‘You still have spots’, Bond complains during their first meeting). Yet it’s the emotional substance which elevates Skyfall to the realms of the all-time great Bond films. In the midst of a frantic London chase, Mendes and his editors cut between the action and a senate hearing in which M is effectively put in the dock, putting forth a passionate case as to why her organisation is so vital It’s a metaphorical statement for the film itself: it critiques the Bond legend whilst validating its existence in this era of expensive blockbuster competition. The movie is dotted with bold moves such as these. For example, it eventually becomes clear that this is a Bond movie in reverse, getting the exotic locations out of the way in the first half and honing everything down to a siege shootout in the Scottish highlands at the climax. Again, this all goes back to Bond, adding powerful layers of emotion to a character with whom we’ve become familiar over the past 50 years. It begs the question: why haven’t we got to know him to such a personal extent in the past? The film is too long and may have too many quiet longeurs for purists, but by treating Bond as a human rather than a superhero, Skyfall is transformed into gripping viewing, and one of the best blockbusters of 2012.